A scene from a bucket shop in 1892. As defined by the U.S. Supreme Court, a bucket shop is "an establishment, nominally for the transaction of a stock exchange business, or business of similar character, but really for the registration of bets, or wagers, usually for small amounts, on the rise or fall of the prices of stocks, grain, oil, etc., there being no transfer or delivery of the stock or commodities nominally dealt in". According to The New York Times in 1958, a bucket shop is "an office with facilities for making bets in the form of orders or options based on current exchange prices of securities or commodities, but without any actual buying or selling of the property". People often mistakenly interchange the expressions "bucket shop" and "boiler room", but there is actually a significant difference. A boiler room has been defined as a call centre where high-pressure salespeople call lists of potential investors (known as "sucker lists") to peddle speculative, even fraudulent, "securities". In contrast, a bucket shop could be better thought of as a place where people go to make "side bets" – similar to a bookie. In the UK, a "bucket shop" usually means a travel agency that specialises in providing cheap air tickets, often packaged with bogus accommodation arrangements. The origin of the term bucket shop has nothing to do with financial markets, as the term originated from England in the 1820s. During the 1820s, street urchins drained beer kegs which were discarded from public houses. The street urchins would take the dregs to an abandoned shop and drink them. This practice became known as bucketing, and the location at which they drained the kegs became known as a bucket shop. The idea was transferred to illegal brokers because they too sought to profit from sources too small or too unreliable for legitimate brokers to handle. The term bucket shop came to apply to low-class pseudo stock brokerages that did not execute trades. Bucketing of orders violates several provisions of U.S. securities law. These prohibitions apply to legitimate brokerages as well as bucket shops. Bucket shops specializing in stocks and commodity futures appeared in the United States in the 1870s, corresponding to the innovation of stock tickers upon which they depended. 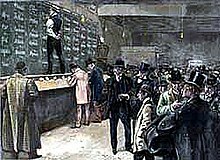 In 1889, the New York Stock Exchange addressed the "ticker trouble" (bucket shops operating on intraday stock price movements), and attempted to suppress bucket shops by disconnecting telegraphic stock tickers. This embargo instead proved a severe hindrance to the Exchange's wealthy local clients, as well as the Exchange's brokers in other cities across the country. It also had the surprising effect of favoring competing exchanges, and was abandoned within days. Edwin Lefèvre, who is believed to have been writing on behalf of Jesse Lauriston Livermore, described the operations of bucket shops in the 1890s in detail. The terms of trade varied among bucket shops, but they typically offered margin trading schemes to customers, with leverage ratios as extreme as 100:1 (a deposit of $1 cash would permit the client to "buy" $100 in stock). Since the trades were illusory and not settled in the real market, the shop likewise made no real margin loans, but did collect interest in cash from the client. The client could easily imagine that he had been loaned a great sum of capital (in fact an illusion) for a small cash deposit and interest payment. To further tilt possible outcomes in their favor, most bucket shops also refused to make margin calls. The elimination of margin calls was portrayed as a benefit and convenience to the client, who would not be burdened by the possibility of an additional cash demand, and touted as a feature unavailable from genuine brokerages. This actually made the client more vulnerable to a heightened risk of ruin, with the losses flowing entirely to the bucket shop. In this situation, if the stock price should fall even momentarily to the limit of the client's margin (highly likely with thin, highly leveraged margins in volatile markets), the client instantly forfeits the entire cash investment to the shop's account. Margin trading theoretically gives speculators amplified gains, but trading in a bucket shop exposes traders to small market manipulations due to the shop's agency. In a form of what is now considered illegal front running and self-dealing, a bucket shop holding a large position on a stock, and knowing a client's vulnerable margin, might sell the stock on the real stock exchange, causing the price on the ticker tape to momentarily move down enough to exhaust the client's margins. Through its opportunistic actions, the bucket shop thereby gains 100% of the client's investment. The term bucket shop came to apply to other types of scams, some of which are still practiced. They were typically small store front operations that catered to the small investor, where speculators could bet on price fluctuations during market hours. However, no actual shares were bought or sold: all trading was between the bucket shop and its clients. The bucket shop made its profit from commissions, and also profited when share prices went against the client. Bucket shops were made illegal after they were cited as a major contributor to the two stock market crashes in the early 1900s. The activity flourished until outlawed in the 1920s. In the United States, the traditional pseudo-brokerage bucket shops came under increasing legal assault in the early 1900s, and were effectively eliminated before the 1920s. Shortly after the failure of many brokerages on the Consolidated Stock Exchange in 1922, the New York assembly passed the Martin Act, which essentially banned bucket shops. ^ Gatewood v. North Carolina, 27 S.Ct 167, 168 (1906). ^ "Peter J. M'Coy, 70, Former U.S. Aide". The New York Times. July 19, 1958. Retrieved April 10, 2017. ^ John Hill, Gold Bricks of Speculation 39 (Chicago Lincoln Book Concern, 1904). ^ Ann Fabian (1999) Card Sharps and Bucket Shops, New York: Routledge, p.189. ^ Hill, John Jr., Gold Bricks of Speculation, (Chicago, Il.,: Lincoln Book Concern, 1904) p.39. Quoted in Markham, Jerry The History of Commodity Futures Trading and its Regulation, (New York, Praeger, 1987) Chapt. 1 n.13. ^ For example, see California's definition, Washington State's definition, Pennsylvania's definition, or Mississippi's definition Archived September 27, 2007, at the Wayback Machine. ^ 7 U.S.C. § 6b, "It shall be unlawful to bucket an order ..."
^ United States Court of Appeals, Fourth Circuit. (22 January 2002). "00-1488: Commodity Trading Futures Commission v. Esfand Baragosh". 'Bucketing' is commonly done by a so-called 'bucket shop': a business that allows customers to speculate on movements in commodity prices by entering into contracts with the shop rather than by finding a trading partner on the floor of an exchange. ^ "The Statist". 3 April 1889 – via Google Books. ^ Edwin Lefèvre (1923). Reminiscences of a Stock Operator. ^ Edwin Lefèvre(1923) Reminiscences of a Stock Operator, reprinted 1968, New York: Simon & Schuster. (the book is regarded as a roman à clef of the life of actual stock operator Jesse Livermore). ^ Sobel, Robert. AMEX: A History of the American Stock Exchange. p. 30. Chisholm, Hugh, ed. (1911). "Bucketshop" . Encyclopædia Britannica. 4 (11th ed.). Cambridge University Press. This page was last edited on 11 December 2018, at 12:13 (UTC).